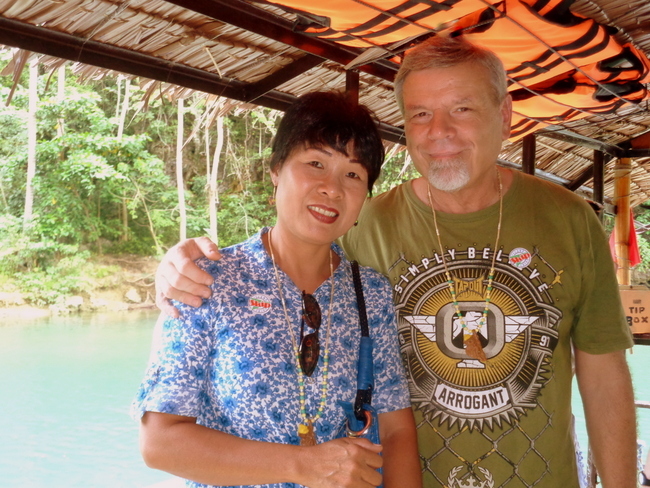 My asawa and I toured beautiful, bewitching Bohol the other week visiting the famous Chocolate Hills and other local tourist sites such as the Loboc River. 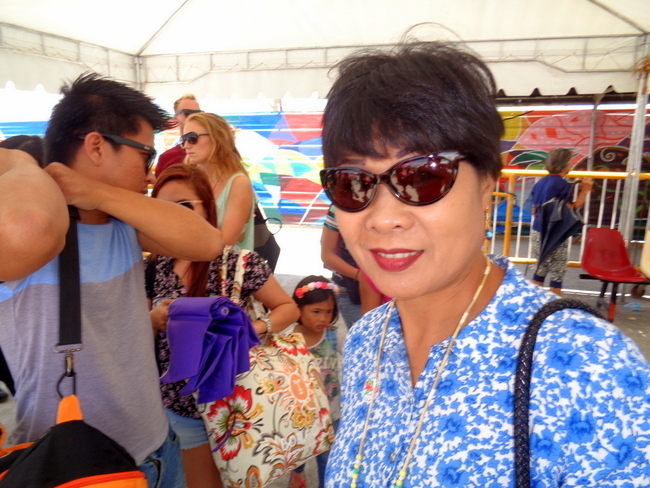 It was a whirlwind one day tour that originated from the SuperCat Ferry Terminal in Cebu City which took us to the port of Tagbilaran in Bohol. 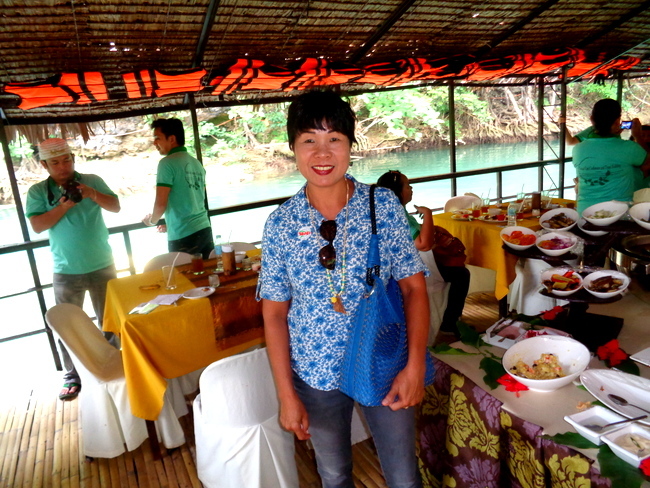 We took a tour recommended on the SuperCat website for a cost of Php 2,980.00 each, 63 US Dollars, which included the cost of SuperCat round trip tickets and lunch on the Loboc River Cruise. All terminal and entrance fees were also included in the tour package. However, due to our late starting time the items crossed off in the above list were stops that we did not make on the advertised tour. Though our tour guide did inform us of the historical significance of the places we did not make it to, it still would have been nice to have stopped at those locations. Aside from the Loboc River Cruise we were rushed for time at the places we did stop at, limited to 15-20 minutes per spot. In retrospect, we would have been better off catching a much earlier ferry and contracting one of the dozen of tour groups that greeted our party at the Tagbilaran Wharf. 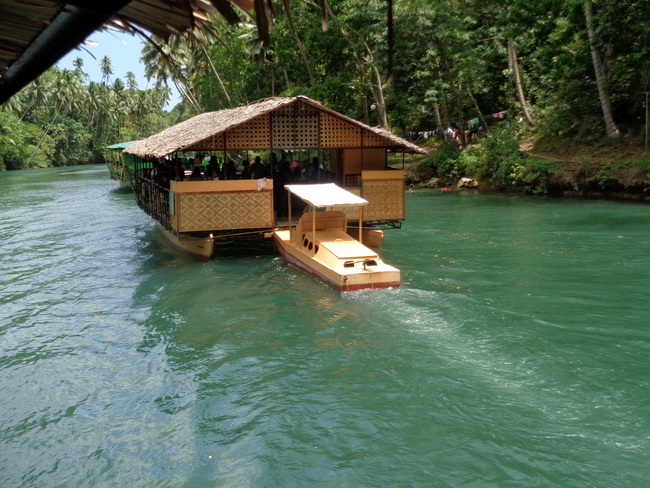 We did travel in air-conditioned comfort as advertised, however, and the Loboc River Cruise, along with the Chocolate Hills, were definitely the highlight of our one day tour. One Japanese man in our tour group was always the last one to arrive back on the tour bus. Our tour guide was always out looking for the man as everyone waiting in our air-conditioned bus knew the Japanese tourist was the one missing. 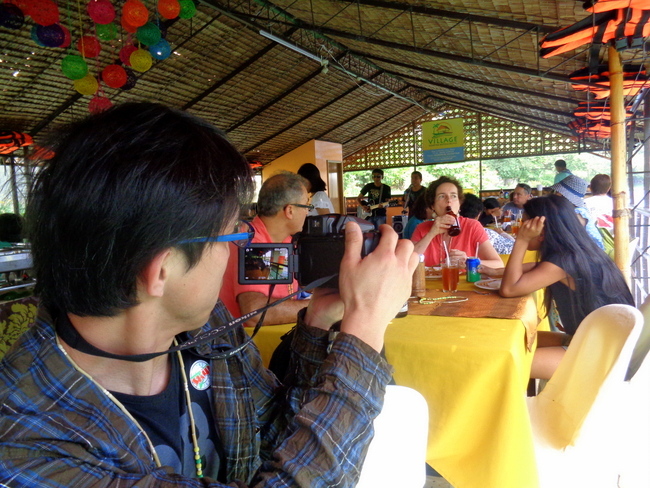 Here’s he’s taking a picture of other tourists on the Loboc River cruise who were enjoying their all-you-can-eat buffet lunch. Drinks, other than iced tea, were not included in the lunch package. The cost of the cruise and lunch would set you back 450 pesos each if you had not purchased a day tour package. 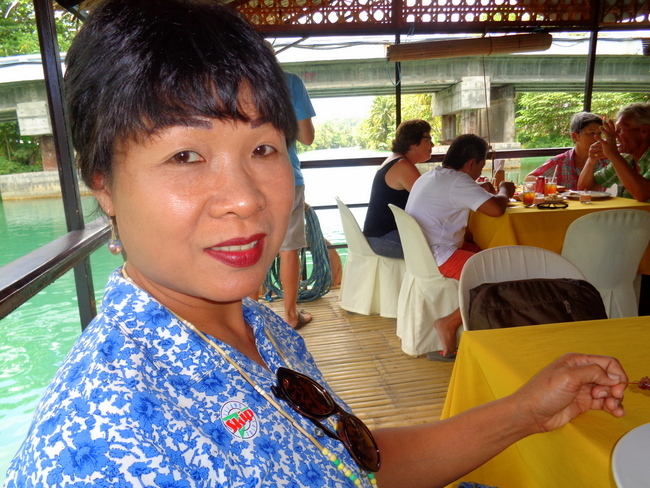 There’s my lovely asawa posing for a picture on the floating restaurant. The lunch featured standard Filipino fare, such as pancit and bihon, and was adequate. They did have plenty of food on hand and no one went hungry. The staff was helpful and there was a trio of musicians who entertained us throughout the trip. My spouse is sporting her Island Skip Tour button which we both wore throughout the trip. Most of the patrons on our particular barge were foreigners, we had three Americans in our group, all accompanied by Filipinas at least 30-40 years their junior. 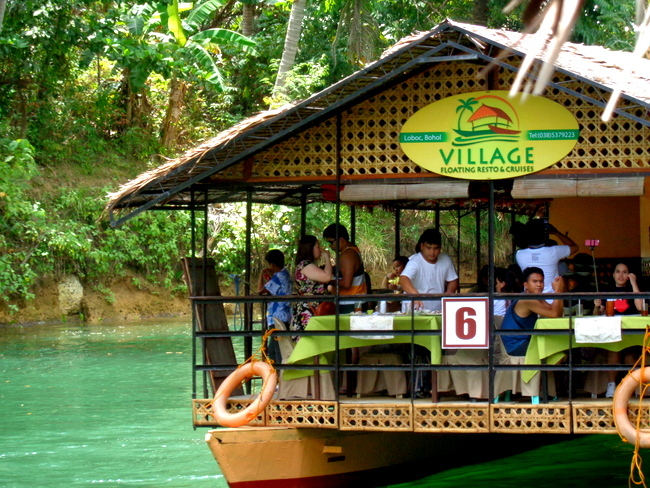 Our floating resto did have a group of Filipinos all working for the same outfit, as they all wore the similar uniforms. 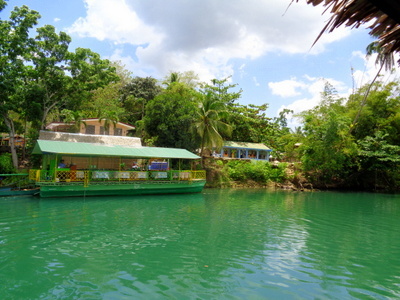 They were quite a boisterous group and seemed to be thoroughly enjoying the Loboc River Cruise in Bohol. One of the foreigners on the trip took our picture for us. A friendly man who I believed was from Austria. We’re both sporting our Tarsier necklaces which we were given to us upon our arrival to Bohol. It was a peaceful scenic cruise that lasted close to 45 minutes. 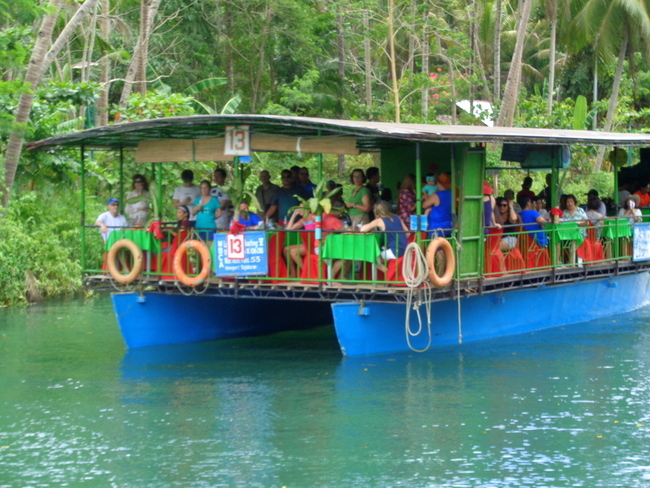 We saw dozens of others floating restaurants on the Loboc River but it seemed to me that everything was commercialized a bit too much. Here’s a look at just three of the many water craft that we encountered. 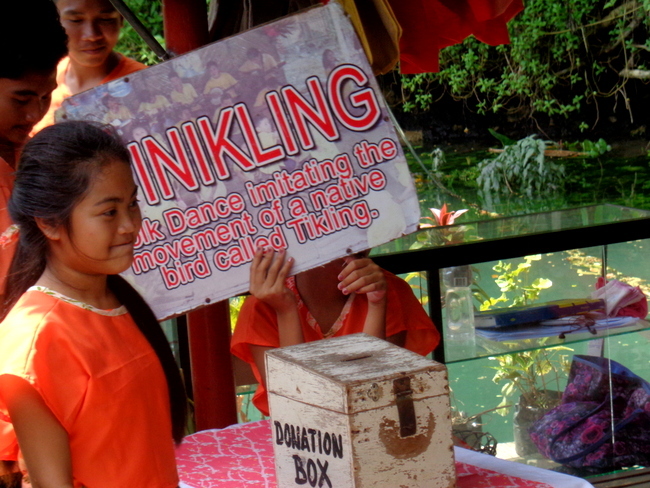 Near the end of the Loboc River Cruise we docked at a local village where a group of young ladies presented traditional Filipino dances such as the Tinikling. We dropped a 100 peso note in the donation box below. 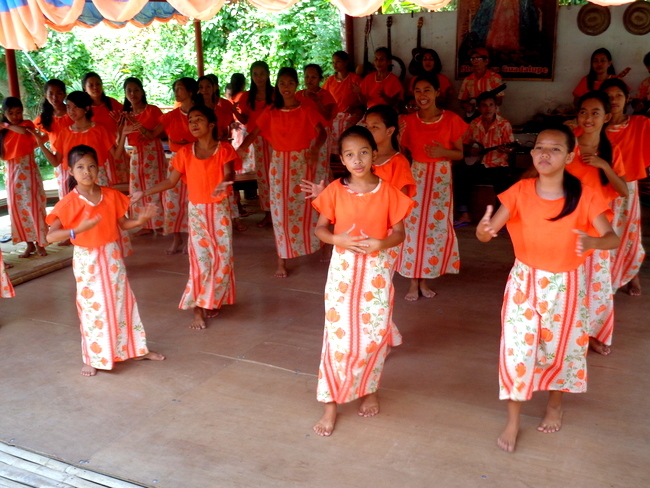 One of the Filipinas from our floating restaurant joined in the dance as did one of the Americans from our tour group. I wisely stayed on the boat. If you’ve ever seen me dance, you’ll understand why. 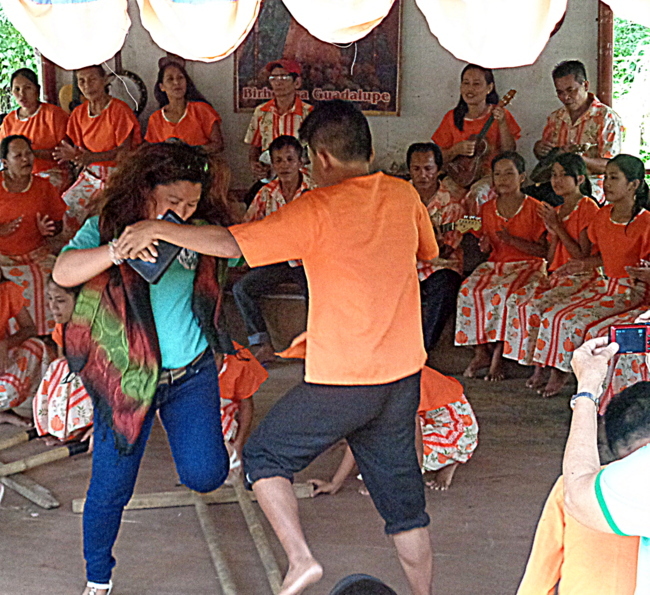 There was no way I was going to embarrass myself (or my wife) by attempting the Tinikling. The Tinikling involves two people hitting bamboo poles on the ground and against each other in coordination with one or more dancers who step over and in between the poles. I’m lucky to be even able to walk without stumbling at my advanced age, let alone attempting some complicated dance maneuvers. 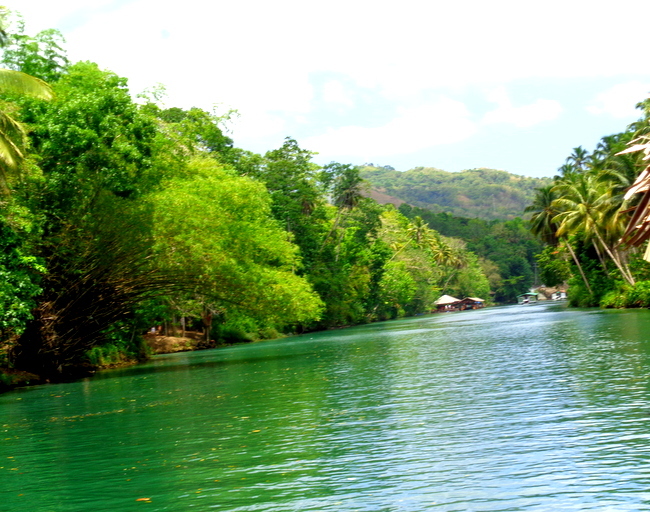 The Loboc River Cruise is something I would recommend taking if you travel to Bohol. It’s entirely possible to visit Bohol and see the sights without the help of a tour group. However, though we were rushed and didn’t get to make every stop advertised on the SuperCat website, I would still recommend going with an organized tour service as it does make traveling around beautiful Bohol much easier. But, as mentioned earlier, take a much earlier ferry to the Bohol port and negotiate with the many tour groups that will meet you at the Tagbilaran Wharf. I highly recommend a trip to Bohol, Derek. The cruise was great and all the locals were very friendly, a very positive experience. We definitely were rushed but as I stated in the post, I would suggest taking a much earlier trip from Cebu to Bohol and then canvas the hordes of tourist outfits that will loudly greet you upon your arrival. Hope to see you in Guimaras one day, quite warm here today, also. 33 degrees Celsius. 91 degrees Fahrenheit. Try and keep cool, our bedroom air con has been on the last few nights, been too warm. We also really enjoyed the trip and tour of Bohol. We were going to stay on Bohol for 9 days, so we were in no rush like you were, thats a lot to see in such a short period of time. We stayed at Kaylaas resort for 8 nights, and when we arrived they had a cab there waiting to pick us up. My wife wisely made a deal with the driver to take us for the next two days to see all the attractions on Bohol, plus he was an very good tour guide and knew all about the history of the places we went to. We went to the Baclayon church and 3 more really old churches, I have always wandered if any of them were seriously damaged from the earthquake a couple years ago, since they were somewhat fragile looking for there age. We have not gone to a lot of places in the Philippines, but every place we have gone we really enjoyed. We hope to see as many places there as we can plus other countries once I get moved there. While I am in relative good shape still, figure we should go as many places as we can, while we can, plus airfare is very reasonable to so many places from there. The 3 months I was there early this year in Davao, it was low to mid 90’s every day while there and only had about 3-4 showers of rain in that whole 3 months, so we also had almost daily blackouts ranging from 20min.-4hours daily, after I left the outages got even longer, so thats why I am kinda thinking Davao may not be for me, mainly the heat, the power outages I can deal with, but north of Davao its not quite so hot it seems, so will be looking at other places to possibly live I think. You really had a lot of time to explore Bohol, Bill S. Your wife was smart to hire a driver, that’s something we did when I first visited the Philippines in 2000 to visit my asawa while we were waiting for her Spousal Visa to the States to go through. Back in 2000 we paid the driver P1,000 and that included his gas expenses. We traveled over 2 hours to visit my wife’s relatives in Metro Manila and used the taxi over eight hours. I don’t have any idea what the going rate for a driver is today. We are planning to visit Palawan next year, God willing. My wife has a brother who is a traffic enforcer there. He was shot at his first day on the job. My asawa has been to the island before but I haven’t been. We have a niece that married a much older Belgian man and our niece used to work at a resort, so we probably will be checking that place out. I couldn’t handle such prolonged brown outs, either, Bill. Our new house is wired for a generator but aside from a 13-hour outage the other Sunday to “prepare for the upcoming election” according to our utility provider, we haven’t had many long outages. It probably would be a good idea for you to check out other places in the Philippines to live. I’ve seen where terrorist groups are sabotaging the power lines in Mindanao and it looks like the government, at least the present administration, is unable to stop these outlaws. But if “The Punisher” is elected President on Monday, who knows what could happen. The water really looks nice on the Lomboc River, nice and relaxing. Have to agree with you on the earlier boat from Cebu. Don’t like to be rushed, especially since i’m retired. It was a relaxing cruise, Papa Duck, but we could have used more time to visit Bohol. Looks like Bill S was smart to have an extended stay there and check everything out. Great story!On an unrelated topic,are the big boxes still be opened for inspection?A few months ago this was being done,but then the chief said that xrays will be taken of the boxes.Anyone know anything about this?We have not sent a big box for over a year,and would like to know what to expect in terms of stealing from the box.Thanks,Joe. PS In your book you say you wish you had sent your tools over…is big box safe for this? Dave, Hope you dont mind if I jump in and reply, but I have sent 8 balikbayan boxes to Davao over the last 6 months or so, so figured I would let Joe know what my shipper is telling me and what experiences I have had with the 8 boxes. I will be using this shipper to also send a container or possibly 2 of all our belongings later this year when I move there. Joe, I think it was last Oct. when a new guy took over the customs bureau in Manila, because of so much corruption and all the extremely long delays that were occurring with almost everything coming into the Philippines, and going through customs. The new commissioner decided that too much merchandise was being sent by OFW’s especially to there families in the Philippines tax free, so he decided in order to put a stop to it, he would make it rule to open EVERY Balikbayan box going through customs, but the OFW’s started complaining so much that it didnt last but a couple weeks or so, and they went back to just randomly opening or x-raying a few boxes from each container I was told. I send my boxes by a small local company in the Va & DC area, and he keeps me pretty well updated on the laws as they change them. New rules that went into effect back in Oct. is that no car parts or motorcycle parts, electronics-flat screen tv’s, cameras, computers, laptops,alcoholic beverages, building materials and tools of any sort, money, prescription drugs and some other things that can be found on there Philippines customs website, if these items are found they will be taxed by customs and you will be responsible for paying the tax or the items will be confiscated by customs. Of the 8 boxes I have sent, 2 of which were sent back in Oct. when the new rules went into effect, by the time my boxes got there, they were no longer opening every box, just back to a few at random like it always has been as far as I know. I have sent electronics, quite a few power tools( a 1hp. pancake compressor and asst. nail guns)and hand tools, and a few other things that are not supposed to be sent and so far I have never been taxed for anything nor has any of my boxes been opened. Along with those things are canned goods, and other food items and things like that, I would advise that you maybe not put certain things on the shipping invoice, although I have put DVD player, and many of the tools I send on the invoice and have never had any problems so far. I would advise that you not send an entire box of tools though, because many of the boxes are still x-rayed and a box of tools only might get caught. Thanks so much for the info, Bill S. I appreciate your insight on this and helping out Joe, and probably some other readers, out on this. This issue is something I need to update in my book when I do next year’s revision. I was not been taxed one centavo either, Bill, when we sent five boxes back in July 2009. We shipped a computer and a tv at the time, along with other miscellaneous items. It’s a good idea to check out the Customs’ website and see what’s restricted now. Nearly seven years ago we sent five boxes using Forex. The boxes were delivered to our doorstep in Guimaras a month later with everything intact. I would go ahead and send as much as you can and take note of the exceptions that Bill noted. Nice article and info on Bohol Dave. This is a place me and my wife plan on taking a trip to once we get moved to the Philippines later this year. I’m thinking we will probally go Bill S. Route and spend a few days there. Joe: if your using LBC you should be fine. I have been sending over a few boxes each month as we prepare for are move and have had no issues. I will be breaking down my tool box and shipping it and my tools over in the next couple of months. Thanks, Roger. I would highly recommend visiting Bohol. It probably is a good idea to spend more than a day there. Thanks for the tip on LBC. Sorry Dave,about the box comment,didn’t mean to be disrespectful.Thanks,Bill and Roger,I feel relieved because I have some tools I do not want to part with for sentimental reasons.My wife says Rudy Duarte would be better president and would clean up airport corruption.Yeah, right,in the Phil,corruption will be with ye till the end of the world…Joe.